Nearly a year ago, tech blog advertising network NetShelter announced InPowered, a service that helped brands promote positive content about their products. In the months since, CEO Peyman Nilforoush (who co-founded the company with his brother Pirouz) said the company was becoming increasingly focused on InPowered. Now the shift seems to be complete, with the company taking the InPowered name. In addition, InPowered is launching what it calls its Earned Advertising Platform. The ads themselves are the same type of thing that the company has been promoting all year, but now, instead of having to work with InPowered to create the ads, brands can create and launch campaigns without any help. Peyman argued that this “creates a new way of influencing people.” When a company releases a new product, positive reviews are going to be much more influential than any banner advertising. Yet those reviews usually only “sit on the front page for a couple of hours” and don’t reach the fullest possible audience. With InPowered, brands are basically paying for advertising, but it doesn’t look like advertising — instead, it’s a collection of article links. Pirouz compared the ads to Facebook Sponsored Stories, except that instead of promoting positive comments from a user’s friends, they’re promoting expert recommendations. In other words, it’s paid advertising that promotes earned media, hence the “earned advertising” name. Pirouz argued that this approach makes sense in a number of industries, including auto, beauty, and financial. It sounds like the company plans to expand its focus to target all of those areas. The NetShelter brand, meanwhile, will still be used by a subsidiary — specifically the tech blog network that will function as one of InPowered’s distribution arms, one that already sees 150 million unique visitors per month. Peyman and Pirouz gave me a demo of the new platform last week. 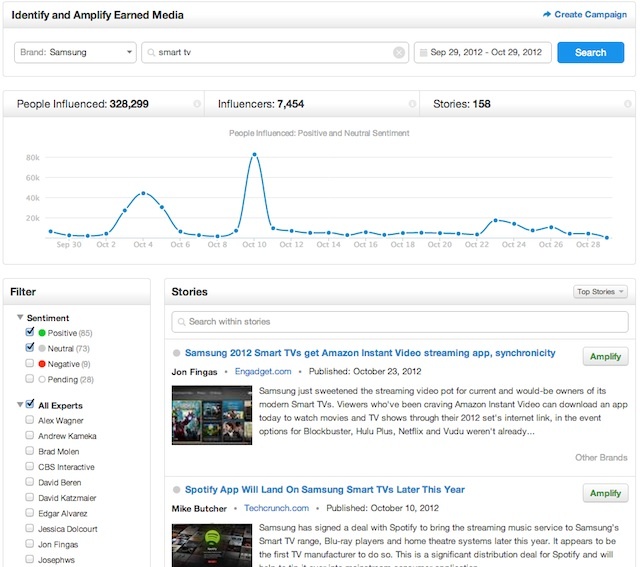 It presents customers with a chart showing how many people have been “influenced” by content about a product (i.e. read related articles), and how many have become “influencers” (shared those articles). The goal, then, is to increase those numbers. Advertisers can browse a list of articles, which are classified as positive, negative, or neutral. When they find three that they like, they can bundle them into a single ad, which then runs as a custom unit on InPowered partner sites, and which will also be distributed through ad exchanges as something more closely resembling a traditional banner. If you’re running an InPowered campaign, the site also includes a button that makes it easy to share positive articles on Facebook and Twitter. inPowered from inPowered on Vimeo.